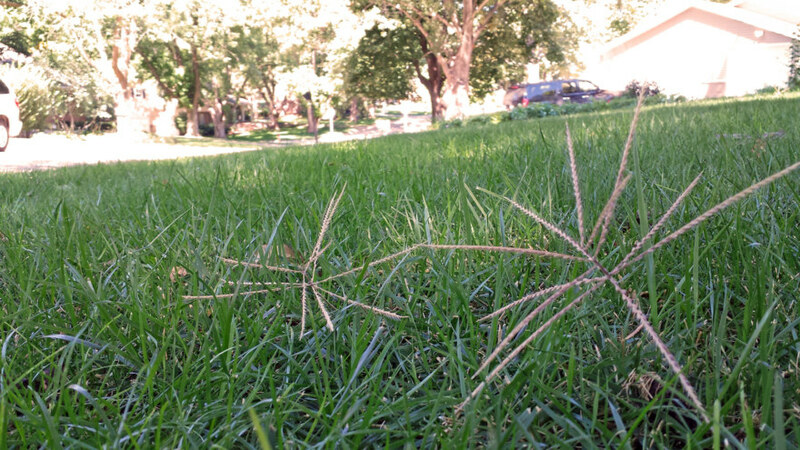 If you’ve ever noticed tiny tumbleweeds and windmill-like coarse grasses popping up in your yard, then you’ve been a victim of windmill grass. This pesky weed grass is not picky about its soil types, seeds quickly, and disperses seeds in all directions. Unfortunately, this makes it difficult to contain. You can recognize windmill grass by its grey-green spiky seed heads, which grow in spokes like bicycle tires or windmills (hence the name). These seed heads detach and roll across the ground like a small tumbleweed, dispersing seeds as they go. Windmill grass is a warm season perennial and can usually be seen from May – September. Windmill grass is undesirable not only because it ruins the look and feel of your lawn but also because it’s a common host for pests like bugs or viruses that will gladly destroy your hard-grown grass. Not only that, but in drought conditions it will steal valuable moisture that could be going to your lawn. There is a new selective herbicide that can be used to target windmill grass. Keep in mind, this will not be effective on zoysiagrass. Tenacity (mesotrione) is a pesticide that can be applied to trouble areas without harming your fescue, bluegrass etc. There will be some bleaching of the surrounding areas, but this will go away within a few weeks. If chemicals are not your first choice, there are other options for your lawn. Aerating your lawn once a year and maintaining proper fertilization and irrigation help prevent windmill grass from showing up. Overseeding your lawn is also another option, because thick lush grass will choke out any unwanted weeds. To deal with this pesky grass organically, you can hand pull and dispose of the weeds before they go to seed. Also, you can remove any detached windmill grass seed heads you see rolling around. Do not dethatch your lawn, that just disturbs the seeds and distributes them into the soil, basically planting them when you want to be rid of them! Windmill seed can be very pesky, but if you keep at it, you can remove it and get your lawn back to its lush, beautiful original state. class="post-template-default single single-post postid-1896 single-format-standard samba_theme samba_left_nav samba_left_align samba_responsive wpb-js-composer js-comp-ver-5.0 vc_responsive"